Born and raised in England. I am a recent graduate from Falmouth University with a BA Honours degree in Marine and Natural History Photography . I have always had a great interest in the marine environment with a particular fascination in cetaceans. With this passion always at the forefront of my mind I tailored my final year university project to cetaceans and undertook the challenge of creating a short Documentary film about whales and dolphins around the UK. Whilst carrying out my project I became a marine mammal medic with British Divers Marine Life Rescue to become more involved with the conservation of cetaceans in my home country. Although I decided to undertake a degree in photography I am also extremely eager to gain as much knowledge and experience in the marine environment as possible with the hope of learning more about data collection, surveying and analysing results. My aim is to eventually combine the two together and have a career in the field of cetacean conservation. With this in mind I focused my Dissertation on Cetacean bycatch, researching into whether Acoustic pingers were a reliable way to reduce the toll of Cetacean bycatch in the UK and what else could be done to help mitigate this global problem. 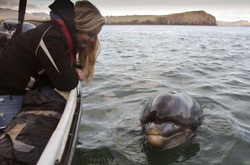 In England I worked as a guide for Marine Discovery Penzance, a renowned dolphin and whale watch boat based in Cornwall. As well as my crew duties I was also responsible for photographing sightings for ID purposes and promotional publicity. Here I became involved in starting a Harbour porpoise (Phocoena phocoena) ID Catalogue, which is believed to be the first photo ID study carried out on this species in England. I am delighted to have been giving the opportunity to join the C.C.P. team and look forward to contributing to the research and learning more about these magnificent animals as well as gaining new skills in the field. At the same time I hope that my skills as a natural history photographer can help bring the scientific work of the Capricorn Cetacean project to light. I hope that the experience gained through these projects will help me fulfil my ambition of undertaking a masters degree in Marine biology. 2013 - BA Honours, Marine Biology and Natural History, Falmouth University (UK).